Historically the All Blacks have been the dominant force in international rugby union - a 76% win rate speaks volumes for a glorious tradition. But since winning the 2011 Rugby World Cup on home soil, New Zealand's supremacy and status as one of the world's most successful sporting teams has swelled incrementally. They have played 47 Test matches in the last four years, and won 42 (89%), with two draws. Only three times - against England in late 2012, South Africa in October 2014, and Australia last month - have the All Blacks tasted defeat. 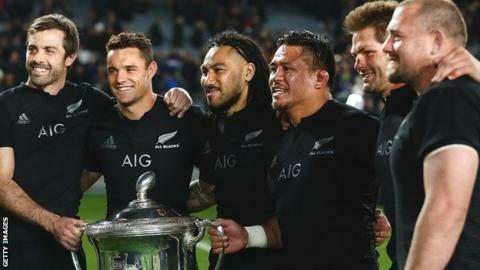 Topping the world rugby list for the past six years, they have occupied the number one spot for 10 of the 12 years since rankings were introduced in 2003. So what is it like to be part of such a winning machine? How are players integrated and nurtured? How is the culture developed and maintained? How do they deal with the scrutiny that comes with it, and maintain the burning ambition to be the best? As New Zealand attempt to become the first country to win back-to-back World Cups, experienced centre Conrad Smith - who has won 78 of his 88 Tests since his debut in 2004 - explains what life is like inside a team of serial winners. "It's always pretty daunting. You come in and it's 'dream come true' stuff, you're obviously nervous. But all the time I've been there, the whole culture has been about going out of our way to make the new guys feel welcome. "We can't let them feel daunted for too long; we want them to express themselves - that's why they're selected. We don't want them to go into their shell; we want them to embrace it and feel like they're ready to do whatever they're asked to do, whether that's on or off the field. "I think that almost without fail, after the newcomers play their first game, they're blown away by how welcoming the whole atmosphere is. I know it was like that for me. "Jerry Collins [the ferocious former flanker who died in a car crash in June this year] was really good to me. 'I'll go easy on you' he said at my first training session. "I said 'I've seen you on TV, mate!' Thankfully you never saw that fearsome side too often at practice. He's one of those good guys who would save it up for when it really counts, for a serious game. "Every newbie that's come in, I've seen feel the same way. It's important, and has helped the team a lot. I remember when I was in their shoes, so I always go out of my way to make them feel comfortable. "I know how much it means for someone like myself [Smith, 33, is one of Richie McCaw's vice-captains] just to have a chat to them, even if it's about something other than rugby, to make them relax a bit and enjoy themselves." "It's not like we're handed a sheet with all these things that we've got to do. You're just told you're an All Black. There are high expectations. "You're expected to know what's right and wrong. If you are unsure, you ask someone who's been around longer than you and they'll give you a pretty clear answer. Then you do what you think is right, what's best for the team. The good thing is the young guys want to be involved so much, that guides them and they don't want to stuff up. "There's no buddy system. There are a few formalities you go over normally at the start of a campaign. The manager or the coach might say a few things. A lot of it, and what we talk about, is 'the leaders lead'. If there's a failing, you don't look at the new guy, the new players, you look at the leadership and how they've let them down. "So there's a big onus on the leaders to make sure they set the tone and lead by example, so that should be followed by the guys coming in. The idea is if they don't follow, they'll wean themselves out." "He's a bloody champion, I tell you. I rely a lot on him for his advice. He's a really vital man to have. Doing my job, it's a whole lot easier having a man like that alongside you. "Conrad's got a great understanding of what teams are trying to do; the psychological, mental side that goes with the game. He's the first one to have an understanding of what's required." "The public expectation is tough to deal with sometimes. It's a bit of a challenge but I think you just embrace it, you realise it's a good thing, if you use it in the right way. "It's awesome having that support when things go well. That's why we want to be All Blacks, we've all dreamed of doing it, because everyone loves the team. "Then it's a matter of making sure you have a balance, you don't get carried away with it and don't think it's daunting and hindering your personal life. That can take a bit of experience. "I think older guys are good at making younger guys understand it. If they see a guy who gets too wound up or caught up in the whole bubble, they're pretty quick to let them know they've got to do things a bit different. "You learn early on that you need a way to take your mind off the game and to distance yourself from the pressure and scrutiny. If you don't have that, it's going to be a tough old life. You don't really survive in the All Blacks if you don't learn it quick. "You've got to be able to relax and realise that it is just a game. The guys with kids will go away and spend time with their families and realise that is what's important in life. Everyone has their own ways of doing it, and the All Blacks have got it figured out more than most." While McCaw has a passion for gliding, Smith enjoys golf, gardening, diving and cooking. "Seafood is what I enjoy cooking the most," he says. "If I'm lucky, I'll get some paua (sea snails) off my mates or go for a dive myself. I love all seafood, but paua is still number one." Smith also works as an ambassador for the So They Can charity in Kenya, working with disadvantaged children. "It's pretty inspiring. I get a lot out of that. They love chasing a ball around and they love wrestling. They always think I'm massive which is quite unusual. They all jump on my arms." "For someone like me who's been around a while, you've got to come up with different ways of playing the game. "You have to keep observing the way it's being played, and how younger guys or other players are doing things in your position, or the way the game's going. At a high level in elite sport, you can never stand still or you get overtaken. "As a team, we talk about that. We know also as individuals, if you keep doing the same thing season after season, the opposition will figure you out. You won't have continued success and you won't keep performing at a high level. "I'm sure it's not easy for the All Blacks coaches to talk to Richie McCaw and tell him he should be doing something a different way, or asking the question of whether what he's doing is the right thing. "But that's what you do. All the time I've had, the coaching team have been good at encouraging but also challenging players, challenging the team - what we're doing and why we're doing it. It's a massive part of it." Can Richie McCaw become the first man to lead his team to successive World Cup triumphs? "You look at that history and the challenge is to lay it down to each player; every year the team that's selected has to add their bit to the legacy. "That's pretty important - you're not daunted by that history, you actually embrace it, you want to add something to it. "There's more to win, there's streaks to extend, there's teams that you don't want to be the first to lose to. There's always more to achieve and that thirst for more is massive within the team. You don't just want to make the team, you want to add your bit to it. "No-one's ever won the World Cup back to back, so that's pretty motivating for everyone, but particularly the group we've got. "When we talk about an All Blacks legacy, there are a lot of things we've done before, but every now and then you find something that even an All Blacks team hasn't done. "We haven't had good success overseas with World Cups, particularly in the northern hemisphere. So winning two World Cups, or a World Cup away from home - those are massive motivators. "We don't have to talk about it a lot, that's the beauty of the team. It doesn't take much discussion, because everyone's aware of it. It's something that burns pretty deep for all the players." Alexander Bisley is a Kiwi journalist covering the Rugby World Cup. You can follow him at @alexanderbisley.